What Should an SEO Audit Cover? 10 Essential SEO Areas. You are here: Home / Horizon Web Marketing Blog / Resources / What Should an SEO Audit Cover? 10 Essential SEO Areas. Will an “SEO Checker” perform a real “SEO Audit”? What business doesn’t want to rank higher in search results? Especially if those search results are on Google. Recently Infront Webworks out of Colorado Springs published a study on the value of a page one ranking, which demonstrated that over 90% of searchers will choose one of the page one results without ever making it to page two (and most of those will be clicking on the top 3 results). Often, when a company looks at their rankings and wonders why they aren’t performing better in search, they think about doing an SEO Audit. Many will do their own search on Google for things like “SEO audit,” “SEO Checker,” “Website Checker,” and so forth. As soon as they do they notice the wealth of free SEO site check tools. For that reason, recently we’ve been looking at SEO Audit tools in our blog posts and videos. 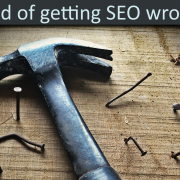 While we will be looking at many useful tools that do fill legitimate search engine optimization needs, we need to clarify that none of these tools can ever hope to perform a full SEO audit (and to be fair, none of them that I have seen claim to do so). Of course as soon as we say “SEO Audit” it seems like we need to take a pause and discuss what a real SEO Audit should cover. This blog post will examine each of these areas. If you’d prefer a video, we have one for you here, but the blog post has more information and details. What does “SEO Audit” mean to you? I think when most business people think of an SEO audit they think of the result. They hope it will be something that will open the door to better visibility in Google search results. We aren’t getting leads off of our website. I never hear customers talking about our website. When I search for us on Google I don’t find our website but I find lots of our competitors. Something’s wrong with our website! LET’S FIND WHAT’S WRONG AND FIX IT! Let them start looking in areas that you never would have thought of for problems you never realized existed. 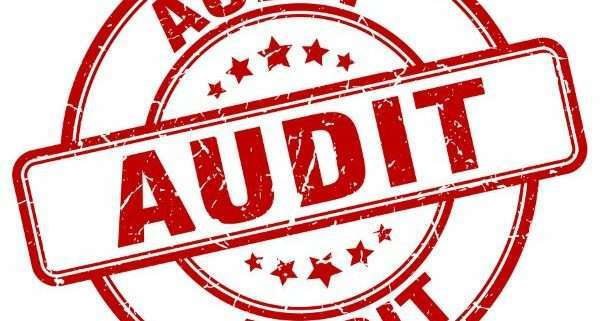 The main difference is that a financial audit is a process that relies on principles that change very little and have been examined across time over millions of businesses. An SEO audit is a process that has been with us a much shorter time, works in an environment of much more rapid change, has to take into account a much more diverse array of variables in terms of technology, marketing, the behavior of 3rd parties (most notably Google). And despite this wealth of challenges, people still want free online SEO checkers, which process their observations in a minute or less, to give them all their answers that a full SEO audit would. It’s an unfair expectation. The first step in the process is to find a competent SEO professional who’s done this sort of thing before. More than once. The purpose of this post is not to tell you how to find that professional, but it might help you to decide which professional you want to “open your books” to. The relevancy portion of an SEO audit is not a simple checklist of items, but rather a survey of whether your website is relevant to the desires and interests of your customer as they are searching online. An audit for relevancy cannot be effectively conducted unless the SEO has had an in depth discussion with you about your typical customer, how they search, why they buy, and so forth. Armed with knowledge of your product or service and information about your customer, the professional then will need to do keyword research related to those factors. It’s only by determining how your ideal customer is searching that the professional SEO can tell whether the content on your website makes it relevant, not just to a bunch of keywords, but to those desires or needs that drive the searches of your ideal customer. In line with this, a full audit would examine your search analytics in Google Search Console to see what queries your website is already showing up for, which gives clues as to how Google views your relevancy right now. One of the most important advantages that Internet marketing offers over traditional marketing and sales is the unprecedented ability to track results. Tracking results alerts to problems, allows for fine tuning of any marketing effort, and insures the best use of funds. There is a wealth of tools and methodologies for tracking a website and how it serves the company’s interests. The downside to this is that website analytics and tracking really need to be set up and configured by an expert, due to the complexity and subtlety of many tracking issues. The wrong tracking is worse than no tracking at all, because it leads to a distorted picture and decisions based on mistaken assumptions. Any full SEO audit should examine the way that a website is tracking visitors, which is usually handled these days by Google Analytics, and should examine the Analytics configuration to make sure it is set up to track in a way that best serves the company’s business needs. Not only is visitor engagement necessary to achieve business goals (see business conversions below), it is also needed to send signals to Google that may help the website to be shown in search results to a broader audience and in a more commanding position on the Search Engine Results Pages (SERPs). Google likes to show websites that engage the visitors. Visitor engagement is another issue where an experienced eye is needed. Any company can read basic metrics such as bounce rate, number of pages per session, average time on page, and so forth. But the numbers are useless if they are not tied back into the business goals and if they are not analyzed by someone who can interpret the data and translate it into action items for the business. An SEO audit should look not merely at engagement metrics, but ideally should ferret out pages that are killing engagement, or perhaps should be able to provide the company at least with an idea about whether their numbers are poor or good, and the implication. Usually free SEO Checkers will give you a good set of data for taking on technical SEO issues, but are blind to your individual business goals. This is yet another area where an SEO audit will be useless unless the professional conducting the assessment has taken some time to learn more about your business and what it needs to achieve from its website. After examining your pages for the presence or absence of factors that will improve your ability to convert visitors to customers or leads, an SEO audit should offer specific guidance on how pages should be changed to reduce barriers to, and increase incentives for, a visitor to take the desired action on your website. Before you ever get a visitor to your website through organic search two things have to occur, 1) the business’s website needs to appear prominently in search results, or the SERPs, and 2) a person who sees your website listed along with 14 other listings on that SERP needs to decide that yours is the website they need to visit. In the SEO business tremendous emphasis is placed on #1 above and often virtually none on #2. An SEO audit, however, should not only look at how your website ranks, but in addition to that should see whether it’s optimized to make the most of any search visibility it’s getting by making sure the “snippet,” that is the listing for your website in search results, makes a compelling case to searchers that they should visit your website to find what they are looking for. One of the most important factors that determine whether your website will be an SEO success or not is the number and quality of other websites that link to yours. These are known as “back links” and any legitimate SEO audit will take a close look at them. They will inform you of the number and quality of these links as a whole, but will also tell you how your website scores on at least a couple of the numerous 3rd party services that will quantify, not only the links to your site, but their overall impact. In addition, however, since links are one of those SEO factors that can actually hurt you if done wrong, an SEO audit will need to determine whether or not there are “toxic links” in your back link profile that constitute a “poison pill” that might kill off your search results quietly, without you understanding the harm that is being done. If an SEO audit uncovers harmful links it will also provide you with a clear explanation of what your options are and show you a path to rectifying the situation. Google looks not only for “authority” created by numerous links, or “votes,” recommending a site, but it also needs to have a high level of confidence that your business and business website are legitimate. For that reason a modern SEO assessment also needs to look at how your brand is referenced online, and how consistently your company is represented — as a company — across numerous “local directories” as well as social media platforms. We already mentioned keyword research under “Content and Relevancy,” but it is so important we thought it needed its own section. Companies always have an idea of what keywords matter when it comes to connecting with their ideal customer in search. Yet I have yet to encounter a business that had a complete picture of the keywords that are important. The reason for this is simple: human behavior is not entirely predictable. When people are online searching, especially now that searches often include voice-to-text searching, they will find an infinite variety of ways to express to a search engine what they are looking for. 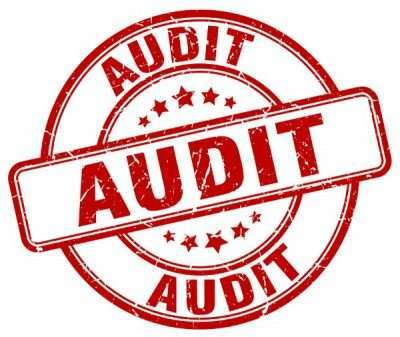 A good SEO audit will take into account the keywords that the business owner wants to rank for, will also survey the keywords that a website is already ranking for, but then will go far beyond that, exploring a wide range of innovative ideas from a number of data sources to discover missing opportunities to connect with important prospects. No search visibility occurs in a vacuum. If I search for “best cellphone under $500” I will join a huge audience that is sought by thousands of vendors, all of them jockeying for position in my search results. If I search on “best cellphone over $2000,” suddenly I will find very few companies trying to appear in my search results. The goal of an SEO audit is to try and quantify the level of competition, usually as a part of keyword research. It also will look for areas where you have a higher chance of success, or, conversely, will help you to avoid fighting losing battles. But more generally, such an assessment will also determine the strength of your primary business competitors in SEO terms, and create a strategy either to help you catch up to them, or stay ahead, depending on where you are right now. 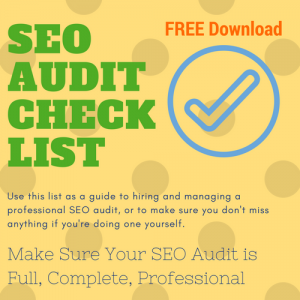 Get the checklist: What Should Your SEO Audit Cover? To help you get a firm handle on this admittedly broad subject, we’ve come up with an SEO Audit checklist that covers each of these 10 areas. Visit this page to request to download this powerful – and free – SEO resource. https://www.horizonwebmarketing.com/wp-content/uploads/2018/01/audit-seal-e1515459155745.jpg 337 400 Ross Barefoot https://www.horizonwebmarketing.com/wp-content/uploads/2017/07/horizon-web-marketing.png Ross Barefoot2018-01-10 22:39:212018-05-08 18:09:07What Should an SEO Audit Cover? 10 Essential SEO Areas.